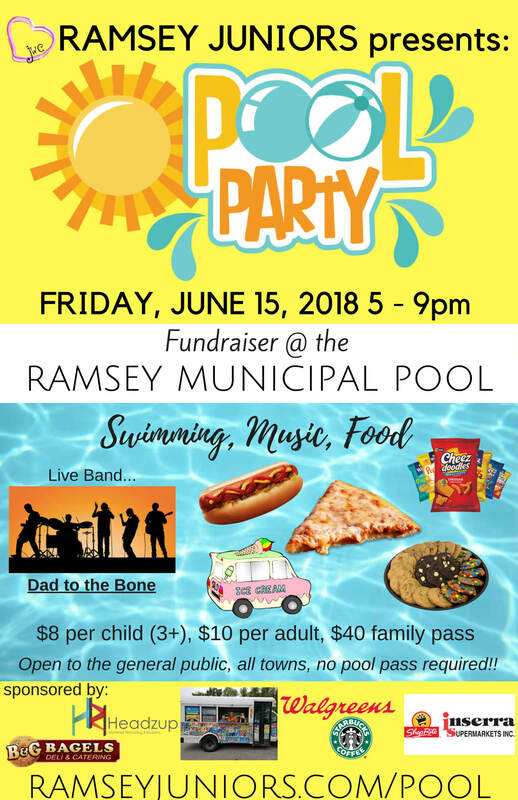 Join us at the Ramsey Pool for a celebration of summer Pool Party Fundraiser. This event is open to the public, you do not need to be a Ramsey resident or Ramsey pool member to attend. ​This is not a drop-off event, all children must be chaperoned by an adult. Rain or shine. Pizza, subs, hot dogs, drinks and ice cream (ice cream truck) will be available for purchase, details to come!! You can also feel free to bring in your own food. All attendees ages 3 and older must purchase a ticket to attend this private event. Food will be available for purchase (pizza, hot dogs, ice cream (truck)) or you may bring your own. Tickets may be paid for via cash or PayPal (processing fee applies). Tickets must be paid in full to reserve your spot. Click Here to purchase tickets. Contact Us with any questions or to pay with cash or check!